KLF chief Harminder Singh Mintoo was today sent to police custody for seven more days by a Delhi Court. NEW DELHI: Khalistani Liberation Force (KLF) chief Harminder Singh Mintoo was today sent to police custody for seven more days by a Delhi Court which allowed the cops to keep him in handcuff as and when required. 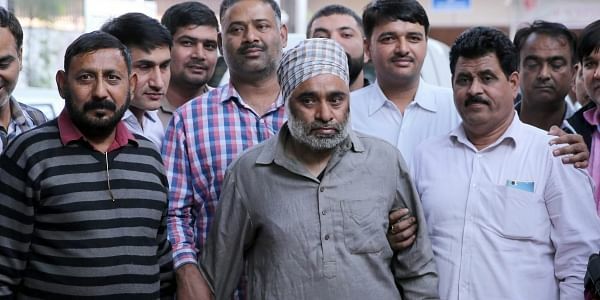 Additional Sessions Judge Reetesh Singh allowed the plea of Delhi Police seeking an extension of his custody till December 12 and also permitted the cops to keep him in handcuff as and when needed considering the fact he escaped from a high- security prison. The defence counsel, however, opposed the plea for custody saying seven days were already given to the police on the last date which was sufficient to interrogate him. The court had on November 28 remanded Mintoo in police custody for seven days saying that his "custodial interrogation" was required to unearth the conspiracy in the Nabha jailbreak case. The police had earlier submitted that they needed his custody to know about the role of "insiders and outsiders" who assisted him and five others in fleeing from Nabha jail in Patiala. It had said that the role of Inter-Services Intelligence and some terror organisations was required to be probed in the case as he had also visited Pakistan. According to the police, one loaded pistol and six live cartridges were recovered from his possession. He was earlier a member of Babbar Khalsa International and later floated his own group, they said. "About 100 rounds of ammunition were fired in the incident of jailbreak and two jail official were injured. He also snatched one rifle from a jail official," the police had said. Mintoo was nabbed from a Delhi railway station, a day after he escaped with five other inmates from the prison. UP Police had on November 27 arrested the alleged "mastermind" of the daring daylight jailbreak, Parminder Singh, from Kairana in Uttar Pradesh's Shamli district when the getaway vehicle -- a Toyota Fortuner -- was stopped at a police picket. He had escaped along with five other prisoners in a sensational prison break after armed men in police uniform tricked the sentries into opening the gates and fled with the inmates while firing a hail of bullets. Mintoo, who was wanted in ten terror cases, was arrested by Punjab Police after he was deported from Thailand in November 2014.